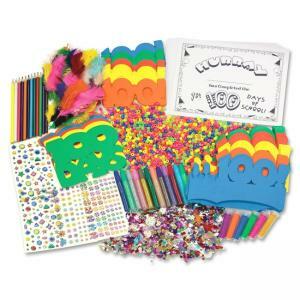 Activity box celebrates the 100th day of school with fun crowns and glasses to wear and decorate and jubilant certificates of completion. Use the included selection of popular art and craft items to decorate the glasses and crowns. Decorations include sequins, beads, glitter, colored pencils and feathers. Certificates offer a space for your student's name. Boxed set includes 25 paper crowns in assorted colors, 25 paper glasses in assorted colors, paper collage boards and 50 ready-to-decorate, 100th day certificates.